I haven’t posted dinner in quite awhile and I apologize for that. I’ve taken pictures faithfully, but sometimes the same old thing for dinner doesn’t feel worth showing. The Food Presentation Police would probably scold me for this wonderful cheeseburger plate. Hmm, I’ll call it The Yellow Plate. Upon first glance one might think that all the yellow foods look boring. This was surely not the case. Onto The Yellow Plate went one of the tastiest cheeseburgers I have had all year…not something I normally seek in everyday life, but it happened and was amazing. A heavy sprinkling of black pepper and seasoned salt helped set this burger up for a win. 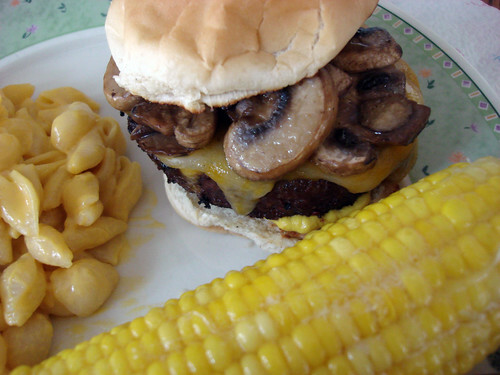 Then the burgers were grilled and eventually topped with a slice of Colby Jack cheese and some sauteed, sliced mushrooms. This perfect cheeseburger needed some more yellow to accompany it, so of course I had to squirt on some mustard. Velveeta Shells and Cheese and boiled corn on the cob completed the plate. Cheeseburgers rock!! This one so much that I didn’t even miss the bacon!